Las Arañas Spinning and Weaving Guild was formed in 1971 b​y a group of spinners and weavers in the Albuquerque, New Mexico​ area. Its goal is to provide education and learning ​experiences for its members and increas​e awareness of and appreciation for fiber arts throughout New Mexico and beyond. ​Let us be one of your rituals of connection! Fabrics that appear to change colors as the light and orientation change seem almost magical! Despite the restrictive “rules” you might have heard, these fabrics are easy to weave, and it doesn’t take gossamer silk or just plain weave to do it! Learn the many factors that influence the results: hue, value, luster, weave structure, and more. This is a Las Arañas workshop & the cost is $180 (plus $35 for non-members) plus any materials fee. A $25 deposit is required. Please fill in the registration form on the workshop page. More details listed there. An in-depth look at the correlation between values and shading techniques, this workshop will explore how to create gradations using demi-duites (dots), weft-bundle blending, alternate line gradations, hatching & hachures. Beginning Knitting is for the no experience, want-to-learn-knitter. Learn knit & purl stitches, several cast on methods, bind off, increase and decrease. Also includes types of yarn, knitting abbreviations & how to read yarn labels. 1st project is a fast, easy skinny scarf. Ongoing Knitting is for students who have the basics and want to learn more skills, how to read patterns, add more stitches. Patterns included are Triangle Shawl, Wash/Dish Cloth, Cable Headband, Hat on double-pointed needles, Poncho, Customized Pullover Sweater pattern & Toe-up Socks. The classes are at SW Craft Connection, 3107 Eubank Blvd NE #27, Scottsdale Shopping Center. Cost is $50 plus tax. Register at www.swcraft connection.net Contact Robin at 286-1783 or robin@perfectbuttons.com with questions. April 5; 10:30—1:00+, $40. Bring a lunch. This is a good beginner class. April 12; 10:30—1:00+, $40. Bring a lunch. This is a good beginner class. April 17; 10:30—1:30+, $75. Bring a lunch. If you do not complete the rabbit during the class, you will have the hardware and wool to take home and a 2nd class ($25) can be held (if you choose) to address any challenges you want help with. You should have some experience with Needle Felting. ​April 5; 10:30—1:30+, $40. Bring a lunch. All classes are at Nob Hill Fabrics. All materials included. Call Judy at (540) 661-2748 to schedule. Vogue Knitting designer, in classes June 21, 22 &23. All classes at the store, call or come in to register and pay the class fee before April 20 to reserve your space. South Valley Multipurpose Senior Center. 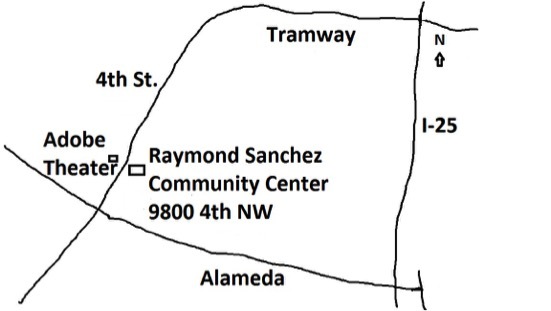 Raymond Sanchez is located on the east side of Fourth Street a little ways north of the intersection with Alameda. In this class, students will learn to spin on a drop spindle and on a wheel. The class fee is $90 plus tax; the kit fee is $30 and includes a drop spindle and fiber. The class is at SW Craft Connection, 3107 Eubank Blvd NE #27, Scottsdale Shopping Center. Register at www.swcraftconnection.net/events/entro-tospinning-2-sessions. All workshops are at the South Valley Multipurpose Senior Center, 2008 Larrazolo Rd. SW on Saturdays, 10-1. They are for Intermediate to Advanced Spinners. Limit of 12 participants. Bring your spinning wheel, 3 bobbins, skein winder & 6 ozs. of at least two different colors to the March 23 & April 27 workshops. It’s the same for the Pet Hair workshop, except needed are a spool of silk thread & at least 3 ozs. of animal hair if you have it, but not the 6 ozs. of other roving. Donation requested $30 for each workshop. Supplies available for a nominal fee. A stash table of wooly bits and “spices” with a drum carder will be available for creative impulses. Questions? ScienceTcher@gmail.com or (714) 721-7505. Do you already spin and know how to do two-ply, but would like some special techniques? This workshop is for you. You’ll learn how to create fancier yarns in a more determined fashion. This workshop will cover 3 kinds of double plied handspun yarns: Spiral Yarn, Flame Yarn & Gimp Yarn. New to Spinning & Weaving ? Try this Page.